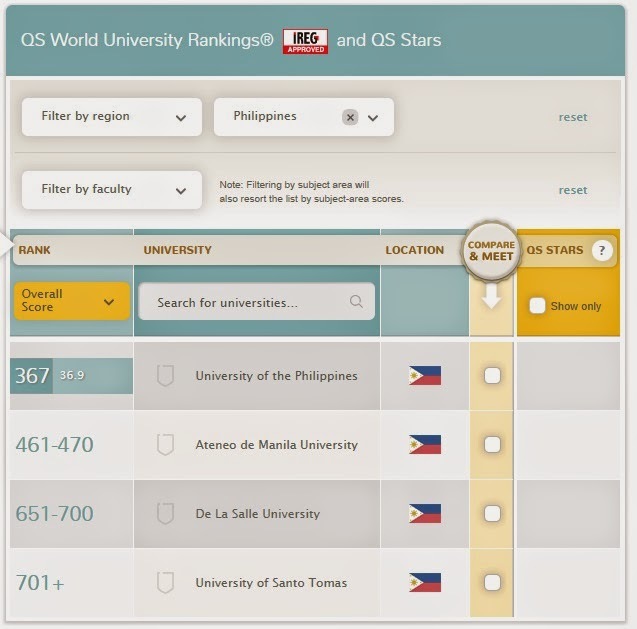 MANILA, Philippines - The 10th edition of the QS World University Rankings has been released today, September 16, 2014 with two local universities, the Ateneo de Manila University (ADMU) and the University of the Philippines (UP) rose in the top university rankings in 2014. Leading global ranking of higher education institutions Times Higher Education - QS (THE-QS) said that UP is now ranked 367 from 380 in 2013, while Ateneo rose to 461-470 from last year's 501-550. De La Salle University (DLSU) fell from 601-650 to 651-700, while the University of Santo Tomas (UST) is still at 701+. The Top 10 Universities in the World list is still dominated by Massachusetts Institute of Technology (MIT) in USA followed by UK's University of Cambridge and Imperial College Londo, tied on second spot. US universities account for 28 of the top 100 places, and UK universities 19 – so in fact more than half of the top universities in the world are located outside of these two nations. QS World University Rankings, which uses six performance indicators to assess and compare the top universities in the world each year. Throughout the decade in which QS has been publishing the rankings, the very top the table has remained fairly stable, with just some minor shifts in position each year. Individual ranking options are given to the top 400 universities, while the rest are placed in groups. It compares the universities in terms of research, teaching, employability, and international outlook. In May 2014, QS University Rankings for Asia has been released citing data with UP and UST moved up in ranking.